Jedward voted off X Factor! John and Edwards Grimes, the X Factor twins with the gravity-defying hair, have been voted off the show after a dramatic sing-off with favourite, Olly Murs. 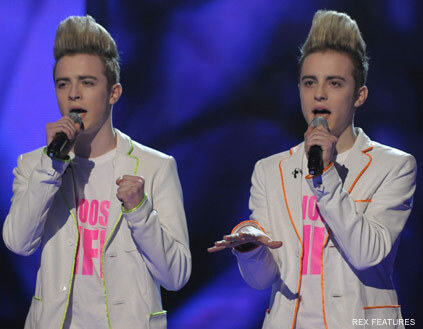 The nation’s favourite indentical twins John and Edward Grimes, AKA Jedward, were voted off the X Factor last night. In a dramatic sing-off between them and show favourtie Olly Murs, 26, Jedward had to sing Boyzone’s No Matter What, but the judges and the public weren’t impressed with their out-of-tune rendition and voted for note-perfect Olly Murs, who sang an amazing version of Eric Clapton’s Wonderful Tonight. The 18-year-old duo have become heart throbs to teenage girls, who love their high hair and fun and energetic performances. Jedward looked upset by the decision last night but there was some good news. The cover of Michael Jackson’s You Are Not Alone, which the 12 X Factor contestants have recorded, has gone to number one in the singles chart. The charity record sold 193,000 copies last week, making it the second highest-selling single of the year so far. Are you pleased Jedward are out? Let us know your thoughts on the twins in the comments box below. X FACTOR HAIR WE LOVE!